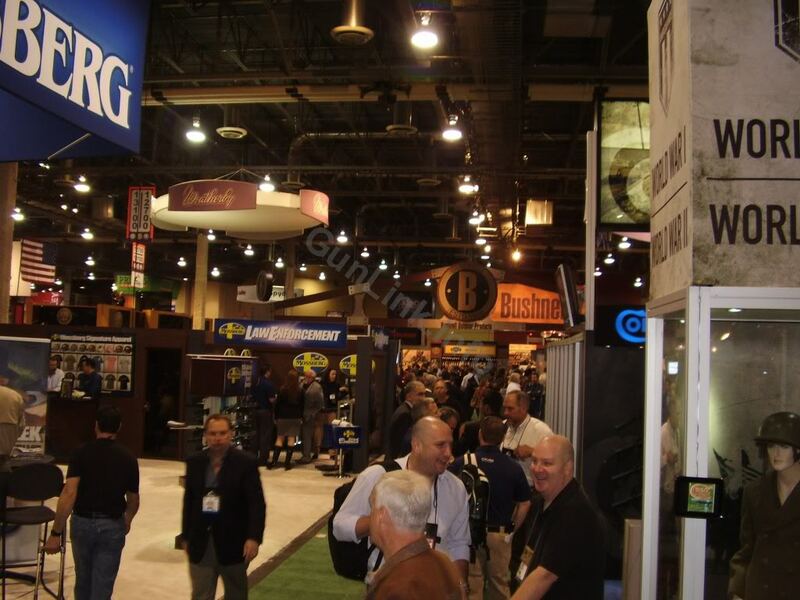 SHOT Show is just around the corner and show preps have begun around GunLink HQ. Planes and hotels are booked, plans are being made, and the anticipation is building. As we have for more than half a decade, the GunLink team will be there to see it all; from the pre-show range day to the final day of exhibits, we'll be bringing you all the news about the latest and greatest guns, gear, ammo, and more. That means the newest firearms that aren't even on the shelves yet, the sneakiest new camouflage that will keep you hidden, the toughest new gear, and much, much more! 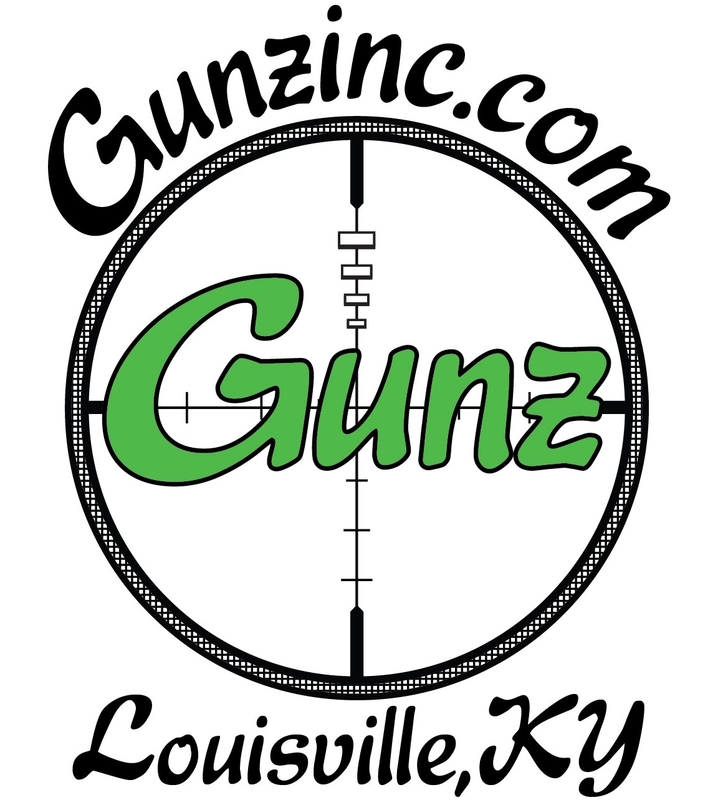 So be sure to follow GunLink to stay up to date on what you can expect to see at the show. 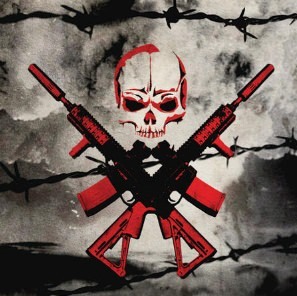 Join the discussion on the GunLink Forums, keep an eye on the GunLink Blog, and connect with us on social media all through the show so you don't miss a thing! Brownells - Serious About Firearms Since 1939! 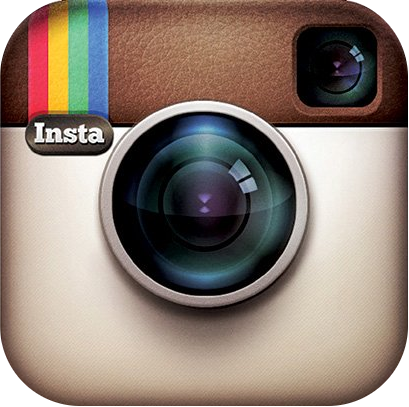 Browning shotgun giveaway every day in Las Vegas! We plan on trying to make it to SHOT Show this year! Looking forward to getting together out there. Is anyone excited for any product? I noticed that some companies have been developing gear, like back packs, for women. Just saw that Weatherby is introducing a new line of women's rifles. Does it take a lot of R&D to make a backpack in Muddy Girl camo? Mossberg is making a shorty AOW. That should be interesting for them to cut out the middleman of the other two manufacturers that I know of making AOWs out of 500s and 870s. Not a firearm, but one of the first products that caught my eye this morning was the Dine&Dash from Dakota283. Dakota283 specializes in traveling dog kennels for hunters. They have complete systems that fit in truck beds that can be heated or have added storage for firearms. The newest item on their line addresses the food and water storage issue that arises when traveling with your furry friend. The Dine&Dash is a portable water and food storage for pets, and even has built in bowls. The dish can hold up to 2.5 gallons of water and up to 8 cups of dry food. While 8 cups may not seem like a lot, this is perfect for weekend trip or a day out in the field. The food goes right inside the main bowl and there is a cover to seal the bowl. On the flip side, there is a hole for water to be added. The dish is mostly hollow inside, which allows the container to hold up to 2.5 gallons of water. There is a small plug on the top in the water bowl portion that needs to be removed before water fills the bowl. The plug does resemble s dog toy, but there is s storage place on the bottom side to safely store the plug. The bowl comes in three color options and is available for purchase on their website for $50. 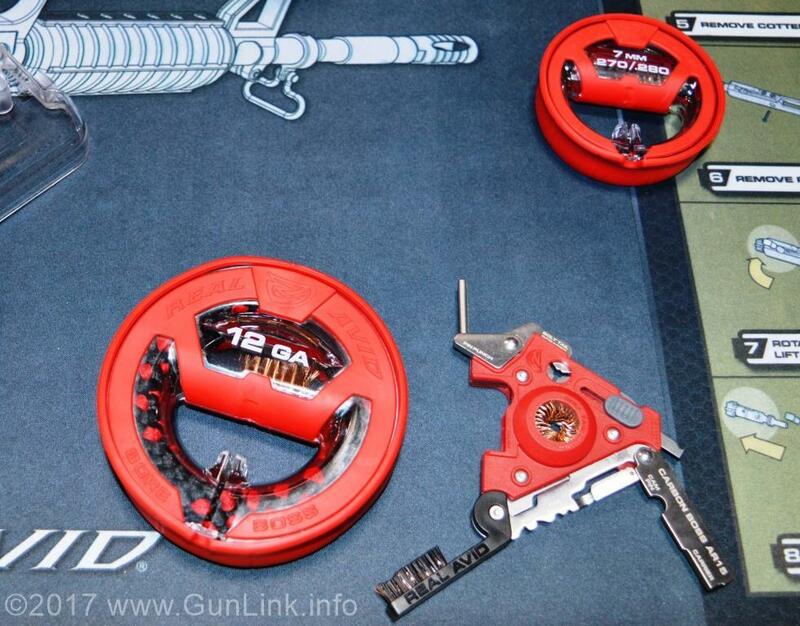 Real Avid is a company that makes gun cleaning as simple as possible. They are known for their gun tool that resembles a multi-tool but it contains everything an AR-15 needs. Real Avid will be releasing a variety of new products this year, including the Bore Boss Kits. These are bore whips that solve the issue of storage after use. The bore whips are contained in flexible case that protects the user, carpet, items in range bag, etc. The flexible case also doubles as a handle for pulling the bore whip through. Each whip is made of a sturdy cable to ensure easy feed through. At the end of the cable is a section bronze brush bristles that is followed by a braided mop. The bore boss is currently available in: 10 calibers and gauges and will be a great addition to anyone's cleaning gear. With an MSRP of $10, this is an affordable product for anyone. Also new from Real Avid this year is the Carbon Boss for AR15s. They already have an AR15 scraper on the market. The scraper is a single tool, about the size of a small pocket knife, that scrapes all 12 bolt carrier group surfaces that accumulate carbon during use. To upgrade that idea, the Real Avid people designed an aestically pleasing triangle-shaped tool to take care of the same 12 surfaces. Other than having a different shape, one other addition is that the Carbon Boss has labels on the tools to inform the user where to use it. Another nice feature is that they added a bronze cleaning brush that is outlined with nylon bristles. The nylon bristles provide extra support to help prevent the bronze bristles from fraying as quickly. It evens comes with a nylons sheath. If you shoot dirty ammo, or suppressed rifles, you definitely need a carbon scraper. The MSRP is $30 which makes this a worthwhile investment for any AR15 user. I am happy to be out here in the desert in good company. 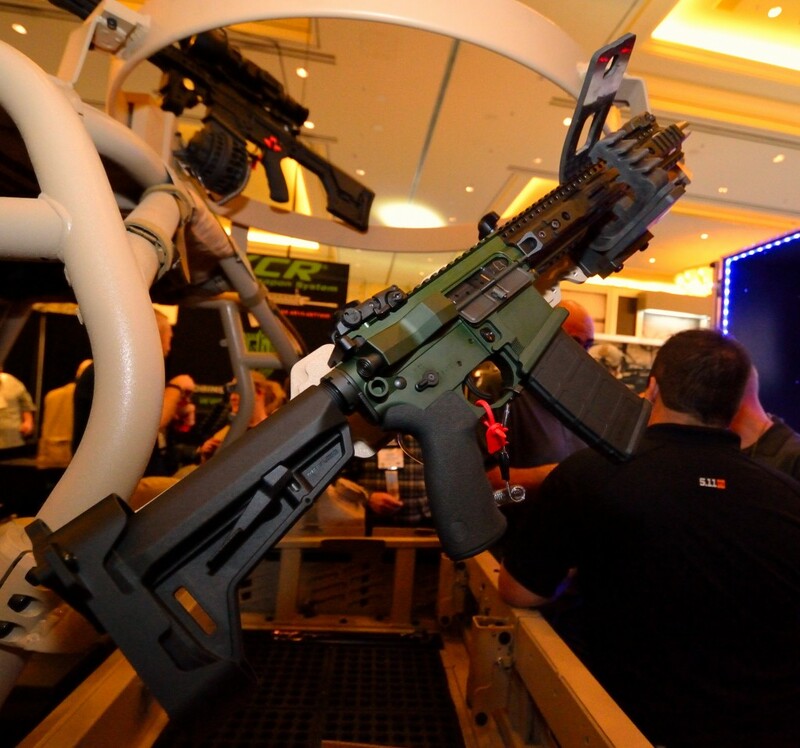 Las Vegas is a great city and is doing very well at hosting another NSSF SHOT Show for all the fantastic enthusiasts and supporters of the industry we love. Let's cut to the chase, in a field of sponsoring innovation and rewarding creativity there are many great items to review. A few things are really speaking to me this this week; special materials that are lighter, tougher & can handle heat better than the standard issue equipment. 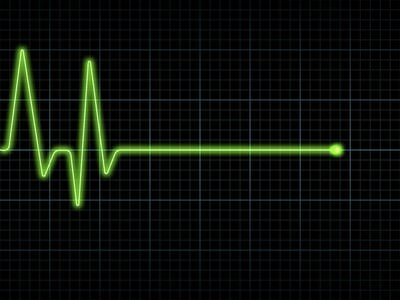 I have seen some items (new and old alike) that may just have what it takes to perform among some of the toughest rigors of service. Stay tuned as I cover some of the hidden gems and front-runners of the show this year. 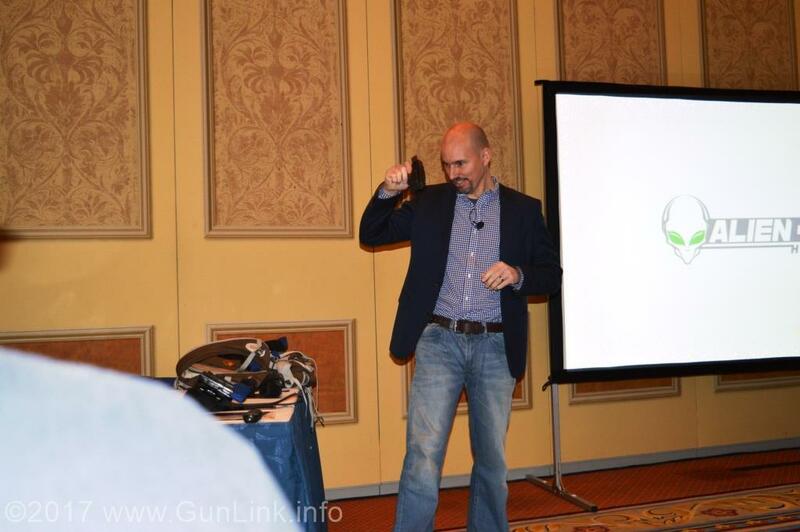 Alien Gear Holsters held a press conference on the first day of SHOT Show 2017 to unveil their latest creation - the Shape Shift Modular Holster System. The new holster system takes the modularity of Alien Gear's Cloak Tuck, Cloak Slide, and Cloak Mod holsters to a new level by utilizing a single holster platform that is capable of transforming into a dozen (and growing) types of carry methods. And company CEO Thomas says that this list is expected to keep growing, with nearly limitless possibilities on how the quick-disconnect holster shell can be used. The new holster platform is expected to launch in summer 2017, although the price has yet to be determined. At launch time, Alien Gear will offer the Shape Shift system for 10 of the most popular carry guns with 15 more to follow shortly after to round out the first 25 models. After that, new models will continue to roll out, with the number expected to grow to 40 by the end of 2017. The holster shells will work with any of the available Shape Shift carry systems. 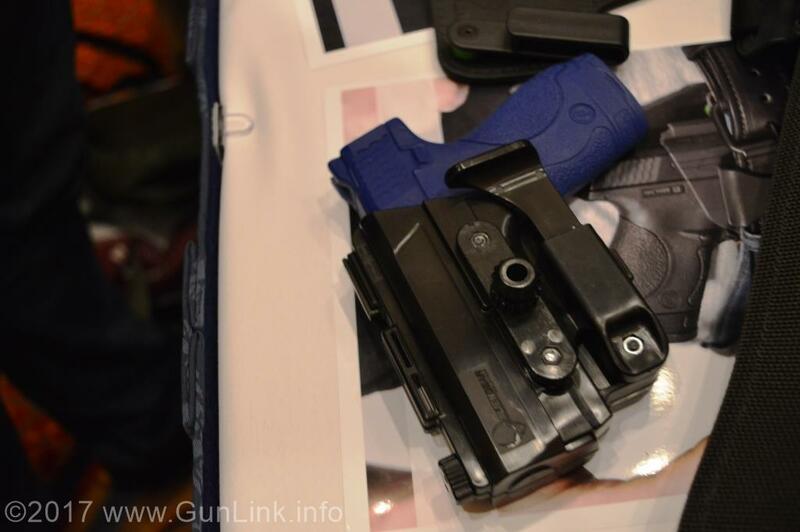 Once the new holster system launches this summer, the easiest way to get into experiencing its versatility will be with the Starter Kit, which will include the traditional Alien Gear style IWB holster (which Tedder says has a noticeably smaller footprint than the current Cloak Tuck line) as well as the hardware necessary to transform it into an AIWB appendix holster, belt slide holster, or a paddle holster. The set will also include parts to enable two separate retention tools - retention bumps and a thumb release. All of this is, of course, backed up by Alien Gear's usual "Iron Clad" forever warranty with a 30-day no-questions-asked test drive. For updates on the new Shape Shift system directly from Alien Gear, check out www.AlienGearHolsters.com/ShapeShift and keep an eye on the GunLink family of sites for more information. Hopefully we will have the Shape Shift added to the Alien Gear Holster review series and take a full, in-depth look at it soon. If you have ever thought to yourself, "man, I need an end table that is made out of a practice bomb", or what do I buy for the guy or girl who has everything, look no further than LuckyShot USA. Everything that they sell is made here in the US from previously fired military munitions. You can find everything from shotglasses with a .308 bullet trapped in the glass to a flag made out of shot gun shells to a shot glass made out of 30mm casings. You can even find an end table that is made of a 155mm anti-tank shell or push-pins made out of 9mm casings. You are bound to find a unique gift on their site for any gun lover in your life. yesterday, while walking the show floor, I noticed that the Taurus logo has been updated. To go with the new logo, Taurus has also launched a new .380 Auto pistol, the Taurus Spectrum. It is the first Taurus product that has been entirely designed, engineered and manufactured here in the USA. It took all of three seconds before I decided that I like it. The pistol fits well in the hand with or without the extended magazine (6 vs 7 shots). The slide has textured groove that makes grabbing and racking the slide simple. It was also very easy to rack, something that I usually struggle with on most .380s. Now, unlike many pistols, this is highly customizable when it comes to looks. There are over 70 color combinations possible with this pistol. There are three frame color options, two slide finish options, and a total of 20 overmold colors options. With an MSRP of $289 - $305, depending on color choice, this pistol should become very popular. The trigger pull is on the lighter side for a DAO and the spring was fairly easy to manipulate. There are already plans to make the PKO in 9mm as well. The 9mm will be a little lighter and have a frame made of aluminum. The .45 is expected to start shipping by March and will retail for $899. The 9mm is expected to be released in the third quarter and will retail for $699. SHOT Show 2017 photos are rolling in. We probably have thousands of them that need processing, so there will be more added for a while. 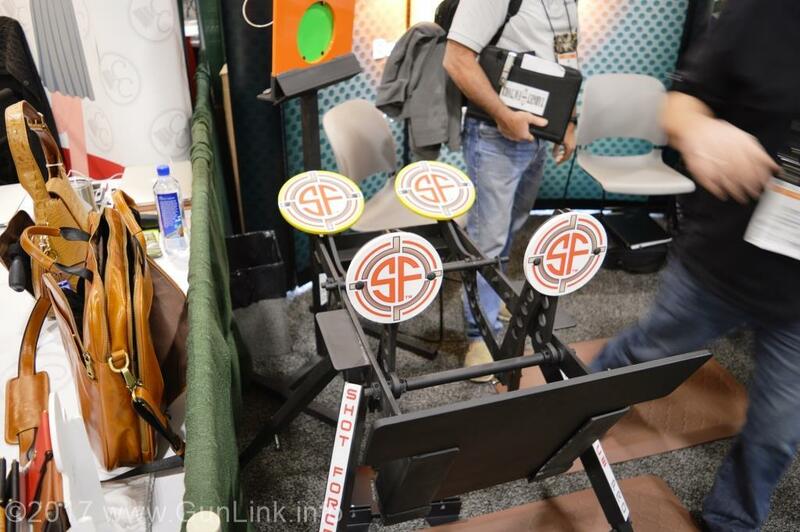 We got a chance to stop by Shot Force Pro and finally see the new resetting plate rack. 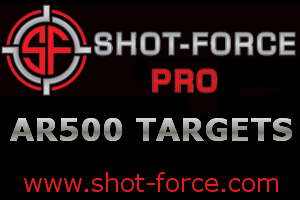 It looks like a great product that could be a fantastic training aid, a fun competitive shooting challenge, or just a fun target to spend the day plinking at without having to keep going down range to reset targets or hang new paper.